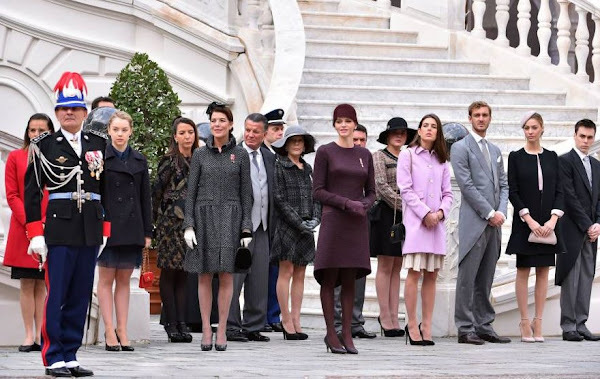 Prince Albert II of Monaco and Princess Charlene of Monaco, Princess Caroline of Hanover, Princess Stephanie of Monaco, Beatrice Borromeo, Pierre Casiraghi, Charlotte Casiraghi, Alexandra of Hanover and Louis Ducruet attend the Monaco National Day Celebrations on November 19, 2015 in Monaco, Monaco. It is Wonderful to see Beatrice! I am also happy that she the special envoy for human rights for Fashion 4 Development. She is a very outspoken and intelligent young woman. I hope to see more photos, especially of the twins! Oui! Quelle classe, très belle! Femme superbe Béatrice! 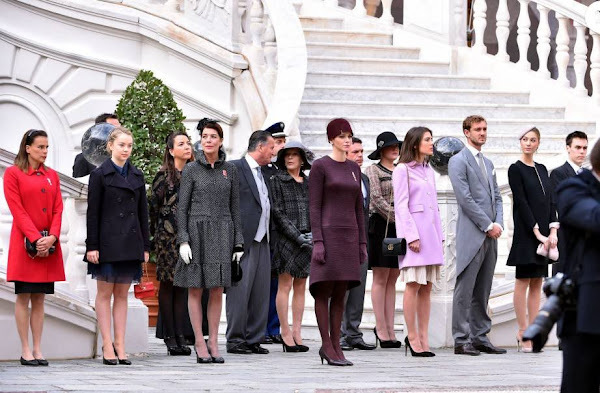 I agree, Beatrice choose a classy dress und looks regal as Princess Charlene. 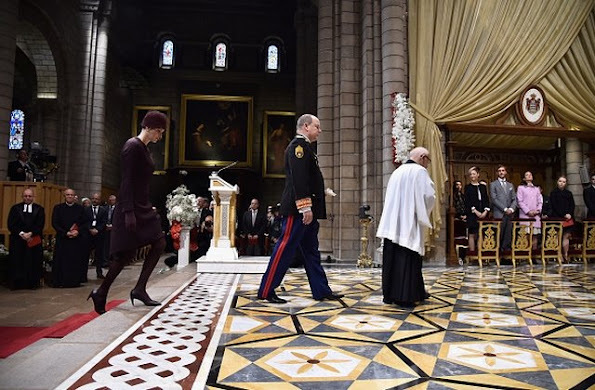 Betrice is really classy and good looking as Princess Charlene, who contributes Monacaos National Day with her wise kindness without pushing herself in the center. Beatrice is absolute stunning. Class and elegance (not to forget she is also an appreciated journalist ) . Charlotte est très chic avec sa tenue d'une jolie couleur automnale et sa coiffe rétro! wow Alexandra is beautiful ! Yes, I agree! I think she will be a beauty just like her sister and mother! Princess Alexandra of Hannover is not an average natural beauty. She has a pleasant lovely appearance. Agree, maybe because she wasn't so slim and her face was more full and of course the age makes the difference also. ik vind het een hele leuke familie!!!!!!!!!!!!!!!!! J'adore la tenue de la princesse Charlène. Cependant, il me semble qu'une minaudière ou un petit sac avec bandoulière aurait bien complété le tout. La main sur le ventre de Béatrice serait-elle annonciatrice d'un événement heureux? Me too! But she has a New boyfriend?!! Yes, Charlotte is fallen in love with an italien Duke of Sanfelice, who is ambitious and sucess-oriented like Charlotte. He is totally different to Gad Elmaleh, his personality is much more stronger and harder. Gad was too weak for her. He always tried to please her in his way and did not get how differnt they were. He will always love her and will not get to know facts. You are right, Gad was very cold - in my opinion he has only a public personality, which is the entertainer and the private person is weak, and not responsible and did not get what he is doing to others - and this is the point which they could share. Gad did not understand, that his offer of relationship was just a tiny step into a personal aquaintance. They both seem to believe in the thing of romantic love. This may explain why Charlotte can change easily. She did not need a recover as other women who faced such a stormy freezing rain. Lamberto Sanfelice could be cordial and happy to have the chance to spend his time with Charlotte. I say ``could`` because of the easy change which indicates that Lamberto is just there to comfort her. What does her little son learn out of this? A big lack of clarity over years. Who can be his role model? Gad? Nanny? Jesus? Every child needs clarity to grow self-respect. I 've always had the feeling Gad didn't love her, but that he was very flattered and proud by the fact this young beautiful "princess" was in love with hem. Becoming pregnant she hoped to hold him. Beatrice is so elegant. She looks amazing, What's wrong with Charlotte? I don't like her new style at all! I agree with you! Her face seems longer with this haircut and her outfit is so pale. 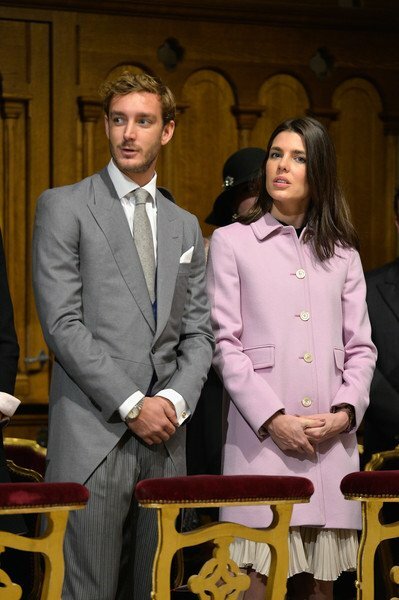 La jupe de Charlotte qui pendouille est ce la nouvelle ligne Gucci? La jupe de Charlotte qui pendouille est ce la nouvelle ligne Gucci ? Charlotte is a beauty, but, unfortunately, she is also a smoker -- following the sad example of her mother and aunt. The smoking is just starting to show in her face. Hope she sees the light and ditches the cigarettes for good. Yes, Charlotte had better beware. Caroline, ah Caroline - I remember when Caroline was born. Caroline was such a beauty; and, even though she is only 58, she now looks old and is showing the bad effects of heavy smoking. Her life has had its tragic side, which has probably also taken its toll on her. Charlotte is an elegant beauty, but, unfortunately, she has followed the sad example of her mother and aunt and is a smoker. And it is just starting to show in her face. Hope she sees the light and ditches the cigarettes for good. 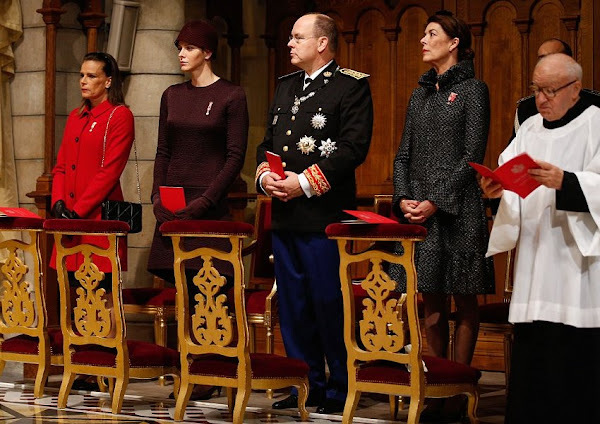 Princess Charlene looks beautiful and contributes their National Day in a festive way. Charlene looks the best of the bunch! she's very stylish and the sleek look of her outfit is perfect on her. Who made it? Princess Alexandra of Hannover is as well elegant and classy and seems to be a lovely person. Comparé a 2012 < Fête Nationale à Monaco> aucune classe Charlotte aujour'dhui. 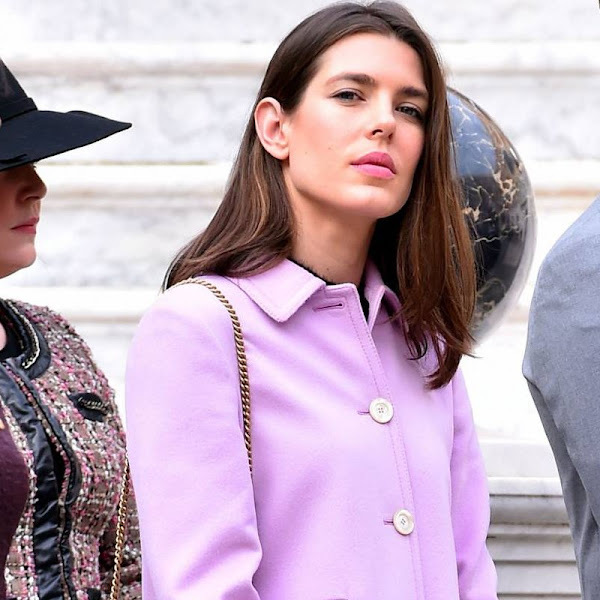 Is Beatrice now Casiraghi or still Borremeo? Princess Charlene is a stunner. Always looking regal and fabulous.